Between November 27 and December 1, 2017, Google launched its annual Google Giving Week again. OCEF had participated in the event in the past two years and raised donations totaling $108,000 and $114,313, respectively, all of which has been put to use in our school aid programs. This time around, thanks partially to a great campaign by a few Googlers who are also OCEF volunteers, over 500 Google associates donated generously to OCEF. Combined with matching funds and charity vouchers from the company, OCEF was able to raise a total sum of $168,875, a 48% increase over the amount last year. OCEF would like to take this opportunity to thank Google and its associates wholeheartedly. 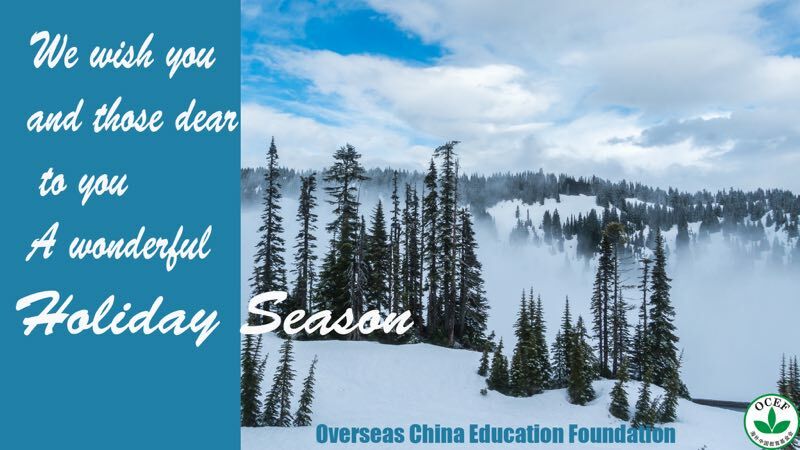 OCEF provided more than 150 rural high schoolers from impoverished areas in 12 provinces, including Gansu, Inner Mongolia, Ningxia, Shanxi, Shaanxi, Guizhou, Jiangxi, Heilongjiang, Sichuan, Yunan, Hunan and Henan, scholarships of $350 each. Some of these students have since graduated from high school and entered college. Because most senior high schools in rural regions are located at the county seats, the majority of the students have to board at school, which costs at least roughly $1,000 each year. 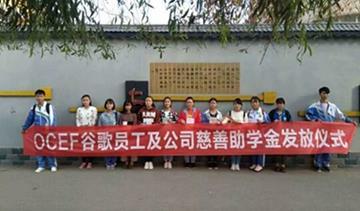 As senior high school is not a part of the national nine-year compulsory education system, this cost becomes a huge burden to the rural families in poverty. Many students with great academic prospect had to drop out early and pick up low-end job to support their families. With the donations from Google and Googlers, some of those students in need can now afford three more years of high school education, greatly improving their opportunities in life whether they pursue further studies in college or enter the job market. In their feedback letters to OCEF, many students talked about the significance of the charity funds in their life and education. The support is not just financial, it is also spiritual, like a star that helps brighten the road to the future. 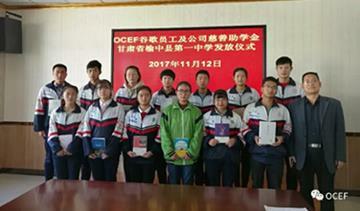 OCEF provided five rural teachers who are not government-sponsored, including Teacher Wang in Huining, Gansu, Teacher Gao in Haiyuan, Ningxia, Teacher Li in Luanchuan, Henan, Teacher Xu and Teacher Du in Songxian, Henan, stipends of RMB￥6,000 each. As these rural teachers are often the only personnel at their schools, the stipends play an important role in the survival of the schools by helping the teachers stay on their jobs. 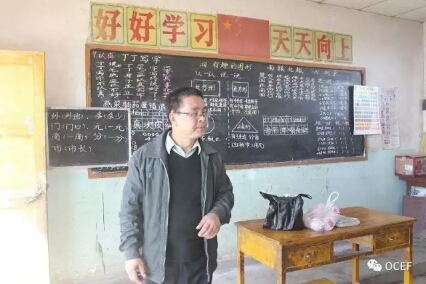 Teacher Wang’s brother used to be a teacher as well, and his students were almost forced out of school when he passed away. Teacher Wang gave up his job that paid ￥500 a month and took over his brother’s teaching position, which paid only ￥15 a month initially. Later on his salary gradually increased to ￥200 a month but has remained the same since 2011. His family depends mainly on farming and his wife’s job out of town that brings home ￥3,000 a year; and they have two school-aged children of their own to support. 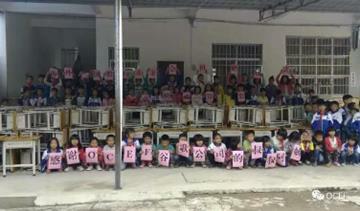 OCEF replaced 200 sets of dilapidated desks and benches at Wang’an Elementary School in Rongshui, Guangxi, which had been in use for over 20 years. Each set costed ￥140, totally approximately ￥30,000 with shipping and handling charges.